THE DREAM is based on a libretto by Rio Mitani. It explores at which age in society we loose our value as humans. Does it mean we have to fight for recognition? Wasn't our unique value given to us at birth from our creator himself, and isn't that enough? Raymonda is one of the famous ballets of Marius Petipa premiered in 1898. It’s beautiful style and the music of Alexander Glazunov still make it to a favorite for the public today. 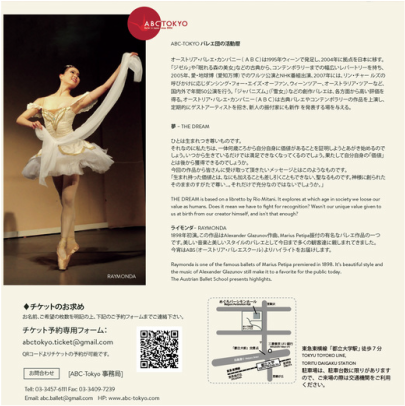 The Austrian Ballet School presents highlights.